Habit: Annual, climbing or prostrate, occasionally short, erect; clings by small, hooked prickles. Stem: 3--9 dm, weak, brittle. Leaf: in whorls of 6--8, 13--31 mm, proximal-most petioled, +- round, distal sessile, +- narrowly oblanceolate. Inflorescence: flowers few on branchlets in most axils. Flower: bisexual; corolla rotate, +- white. Fruit: nutlets; hairs many, short, hooked. Chromosomes: 2n=20,22,42,44,63,64,66,+-86,88. Ecology: Grassy, +- shady places; Elevation: 30--1500 m. Bioregional Distribution: CA (exc DSon); Distribution Outside California: to Alaska, eastern North America; Europe. 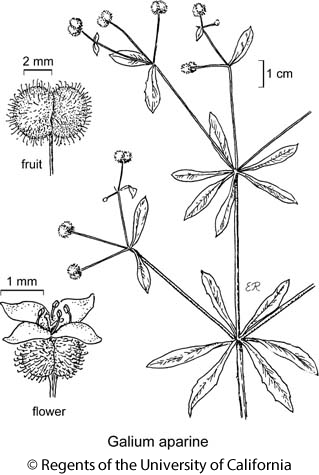 Flowering Time: Mar--Jul Note: Weedy in gardens; if recognized taxonomically, small plants with slender, pointed leaves, +- yellow petals assignable to Galium spurium L.
Citation for this treatment: Valerie Soza 2012, Galium aparine, in Jepson Flora Project (eds.) Jepson eFlora, http://ucjeps.berkeley.edu/eflora/eflora_display.php?tid=26304, accessed on April 25, 2019. CA (exc DSon); Markers link to CCH specimen records. Yellow markers indicate records that may provide evidence for eFlora range revision or may have georeferencing or identification issues. Purple markers indicate specimens collected from a garden, greenhouse, or other non-wild location.